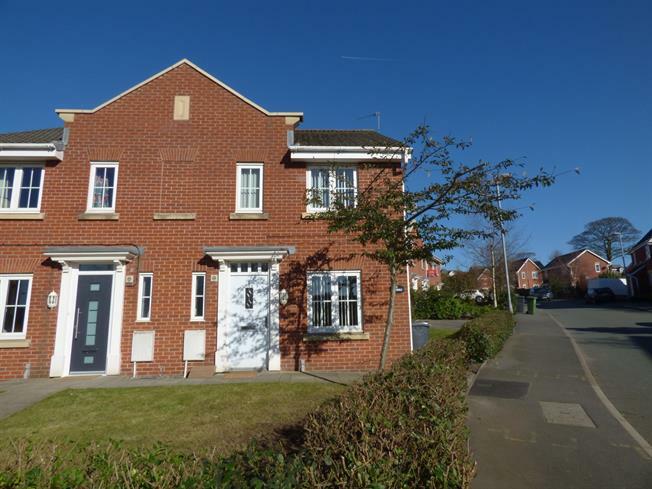 3 Bedroom Semi Detached House For Sale in Hyde for Asking Price £169,950. NO CHAIN!! Situated on a popular residential development is this three bedroom semi-detached property. In brief the property comprises of; entrance hallway, lounge, kitchen/diner and WC to the ground floor. To the first floor are three bedrooms , one with en-suite and a family bathroom. Externally there are laid to lawn gardens to the front and rear and a double drive to the side. Double glazed uPVC window facing the front. Radiator and laminate flooring. Granite effect work surface, wall and base units, stainless steel sink, electric oven, gas hob, integrated dishwasher, space for washing machine and fridge/freezer. UPVC patio double glazed doors opening onto the garden. Double glazed uPVC window facing the rear. Double bedroom; double glazed uPVC window facing the front. Fitted wardrobes, radiator and carpeted flooring. Low level WC, single enclosure shower and wash hand basin. Single bedroom; double glazed uPVC window facing the front. Radiator and carpeted flooring. Low level WC, panelled bath, shower over bath, wash hand basin and double glazed uPVC window facing the rear. Laid to lawn gardens to the front and rear. Double driveway to the side providing off road parking.